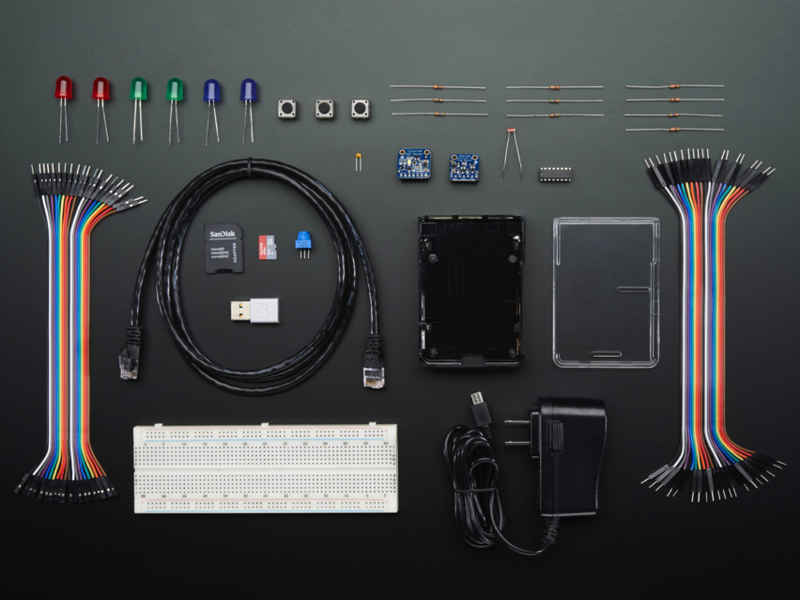 NEW PRODUCTS – Microsoft IoT Pack for Raspberry Pi 2 – No Pi / With a Pi 2 « Adafruit Industries – Makers, hackers, artists, designers and engineers! 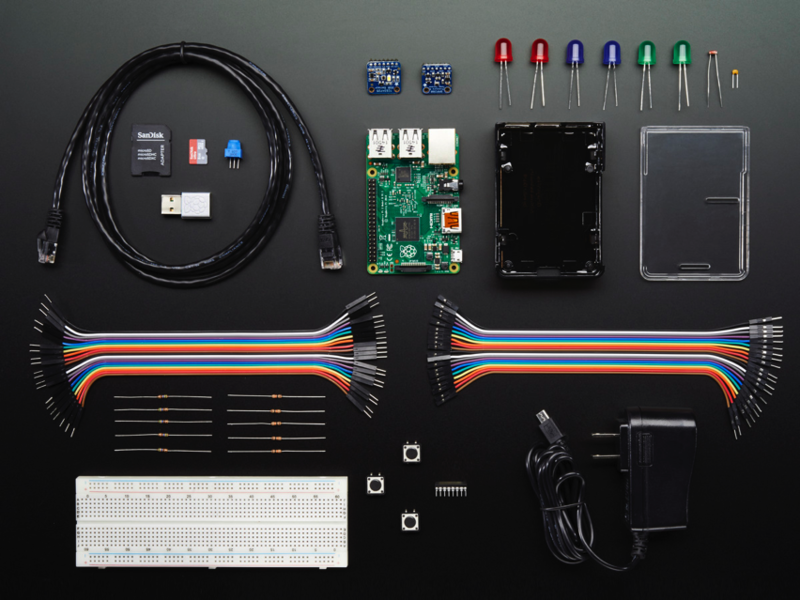 The Microsoft Internet of Things Packs for Raspberry Pi 2 are the best way to get started using Windows 10 and your Raspberry Pi as an IoT enabled devices. 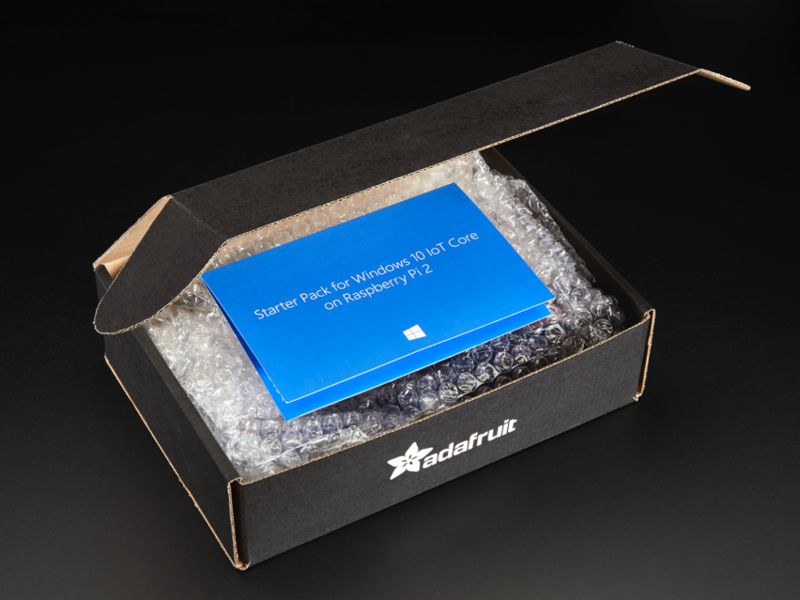 A collaboration between Microsoft’s IoT division and Adafruit, these packs are the best way to get started using both Windows 10 on your Pi and to start doing some popular projects with the internet of things. Check out windowsondevices.com for more information on how to set up Windows 10 IoT Core on your Raspberry Pi and download project samples! You can also use these packs with Raspbian Linux & Python, Here's a few Raspbian-based learn guides that are worth checking out to start. While they're for the Model B, they will all apply to the Raspberry Pi Model B+ and the Raspberry Pi 2. This pack does NOT come with a Raspberry Pi 2 Computer! Adafruit Raspberry Pi B+ Case – Smoke Base / Clear Top – We think it's the Single Greatest Raspberry Pi 2 Model B Case Ever – though our Pi Box Plus is also nothing to scoff at. ​Full Size Breadboard – In the past, we've used the half-size breadboard for a lot of Pi projects – but no longer! WIth 40 pins to break out, you're going to need some space – and that's why we're including a full size breadboard in this pack. Premium Male/Male Jumper Wires – 20 x 6" (150mm) – These jumper wires are great for making wire harness or jumpering between headers on PCBs. We include the longer ones so they work well with the full-size breadboard. Premium Female/Male 'Extension' Jumper Wires – 20×6" – These jumper wires are handy equivalents of the male/male jumper wires – but with female connectors. 5V 2A Switching Power Supply w/ 6' MicroUSB Cable – The 5V 2A power adapter is the perfect choice for powering your Raspberry Pi B+ with 2 Amps of current output, and an extra long cord. Assembled Adafruit BMP280 Temperature & Humidity sensor – The assembled verison of an Adafruit Instant Classic. This breakout board has a powerful BMP280 sensor from Bosh that's good for environmental, temperature, and barometric pressure sensing. This version comes with headers already soldered on. MCP3008 – 8 Channel 10-Bit ADC With SPI Interface – Easy to use, SPI enabled chip that's perfect for adding 8 channels of 10-bit analog input to your microcontroller or microcomputer project. This pack does come with a Raspberry Pi 2 Computer!